Wherever you work, the Samsung SF-650P 4-in-1 multifunction printer has the design features and technology to help you work more efficiently and cost-effectively. And the compact design means you can get all these benefits, even when space is at a premium. High speed 33.6 kbps modem makes for fast communication and enhanced efficiency. Whats more, 7 MB of memory means that you can store up to 500 pages of information. Fast, efficient copying with a copy speed of 19 letter copies per minute. A 250-sheet cassette gives you greater paper capacity and gives you more copying time between refills. Superlative print performance with a print output of 19 letter pages per minute and first-page-out time of less than 10 seconds, the SF-650P gives you the edge on speed. You also get great print quality - up to 600 x 600 dpi effective output. Full-feature high-quality scanning equipped to deal with the most demanding document handling requirements, the Samsung SF-650P offers standard resolution of up to 600 x 600 dpi, enhanced resolution of up to 4,800 x 4,800 dpi, and a scan to PC feature. The Samsung SF-650P is geared to deliver faster, more efficient fax communication. The control panel features 20 assignable buttons for one-touch dialing, and you can also store up to 250 frequently used numbers for speed dialing. You can also store up to 269 contacts, in up to 250 groups of numbers or circulation lists for group dialing to multiple locations. The Multi-send feature can also store 30 contact numbers, so the same fax message can be sent to everyone at once. 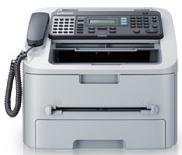 So however many people you need to fax-and however often-the Samsung SF-650P makes it quick, easy and efficient. The Samsung SF-650P offers a choice of consumables to meet your cash-flow needs. High-yield toner cartridges, which are ideal for heavy use, last longer and give you lower costs per page. Optionally, low-yield toner cartridges have the advantage of lower initial outlay. The compact design and sturdy construction are what make the Samsung SF-650P ideal for small workgroups or small office/home office locations. The smart, compact design means it looks good but doesn't take up all your valuable desk space. The tasks of adding paper and replacing toner cartridges are quick and easy, so downtime is minimal and you stay productive longer. The Delay Send button on the control panel stores documents in memory, and allows you to send them during a predefined time period when off-peak call charges apply - allowing you to make significant savings on your phone bill. Selecting TonerSave mode, available on the SF-650P, allows you to use less toner on each page. This extends toner cartridge life by up to 30%, gives you reduced costs-per-copy, and gives you more productive time between toner cartridge changes. A 33.6 kbps modem speed makes for fast communication and enhanced efficiency. What's more, 7 MB of memory means you can store up to 500 pages of information. Copy speed is an impressive 19 cpm. A 250-sheet cassette gives you greater paper capacity and gives you more copying between refills.